(If you have a non A/C truck see details below the dotted line). 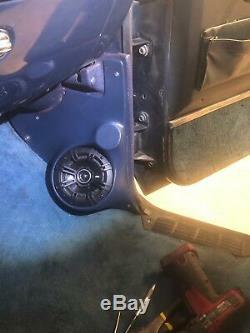 The drivers side panel replaces the existing kick panel and will clear the emergency brake pedal with no modifications. The passenger side is made to fit over the original full or half panel. 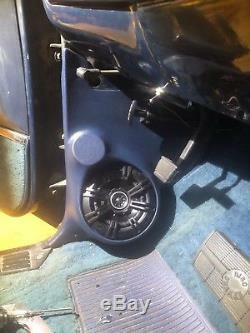 If you do not have an original panel, a good used one works or see my other listings for the right, passenger side panel. 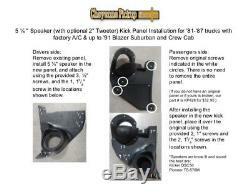 This listing includes the speaker kick panel pair in black, and an installation kit with instructions and screws. Speakers are NOT included but we have installed Kicker DSC50 and Pioneer TS-576M and we know they fit well and sound great. These are easily dyed to match your truck using SEM vinyl dye. See the photos of the blue panels installed in a 1986 Chevy truck. For NON A/C trucks or trucks with DEALER INSTALLED AC. The passenger side will install with no modifications. 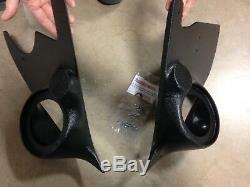 The drivers side will require the use of an original half panel to hold the vent. The new kick panel will need to be cut out to not block the vent. IF YOU ARE ORDERING FOR A NON AIR TRUCK PLEASE LET ME KNOW SO I CAN SUPPLY YOU WITH CUTOUT TEMPLATE FOR THE NEW DRIVERS SIDE SPEAKER KICK PANEL. The item "1981-1987 Chevy / GMC pickup Truck blazer suburban crew cab speaker Kick Panels" is in sale since Friday, January 25, 2019. 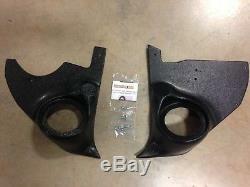 This item is in the category "eBay Motors\Parts & Accessories\Vintage Car & Truck Parts\Radio & Speaker Systems". The seller is "motorhead5907" and is located in Noble, Oklahoma. This item can be shipped to United States, Canada, United Kingdom, Denmark, Romania, Slovakia, Bulgaria, Czech republic, Finland, Hungary, Latvia, Lithuania, Malta, Estonia, Australia, Greece, Portugal, Cyprus, Slovenia, Japan, China, Sweden, South Korea, Indonesia, Taiwan, South africa, Thailand, Belgium, France, Hong Kong, Ireland, Netherlands, Poland, Spain, Italy, Germany, Austria, Bahamas, Israel, Mexico, New Zealand, Philippines, Singapore, Switzerland, Saudi arabia, United arab emirates, Qatar, Kuwait, Bahrain, Croatia, Malaysia, Brazil, Chile, Colombia, Costa rica, Panama, Trinidad and tobago, Guatemala, El salvador, Honduras, Jamaica, Viet nam.